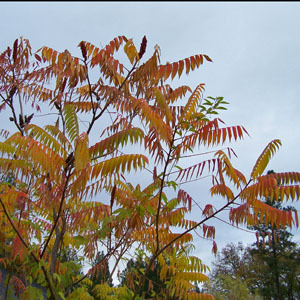 This native of the eastern U.S. is a large shrub to small tree. The branches are covered with brown hairs, like a deer "in velvet", hence the name staghorn. The divided leaves show a vivid red fall color. Dense clusters of fruit are medicinal. They persist long into winter and are a valuable food for birds. Categories: All Items, all potted plants, common names q-z, dye plants, fruits/seeds for birds, medicinal herbs, native American plants, Potted Plants, More..